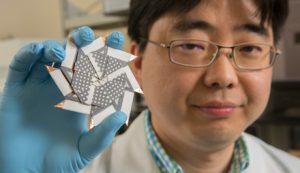 A new disposable battery that folds like an origami ninja star could power biosensors and other small devices for use in challenging field conditions, a Binghamton University engineer says. Choi previously developed a paper-based origami battery. The first design, shaped like a matchbook, stacked four modules together. The ninja star version, which measures about 2.5 inches wide, boasts increased power and voltage, with eight small batteries connected in series.